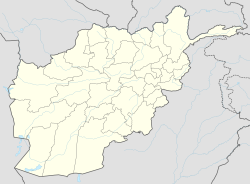 Garmsir District (or Garmser) is located in the southern part of Helmand Province, Afghanistan. The district is large, but all the villages are along the Helmand River. The rest is a desert. The district capital - Garmsir is located in the northwestern part of the district on the east bank of Helmand River. The population is 85,500 - 99% of them Pashtun and 1% Balouch. Wikimedia Commons has media related to Garmsir District. The district is poor. Main sources of income include daily wages (labors, working in fruit markets, and selling home products, driving, shop keeping etc) and agriculture. Agriculture is the main source of income and most of the arable land is irrigated. ^ a b "Settled Population of Helmand Province" (PDF). Central Statistics Organization. Retrieved 8 December 2015. ^ a b c "District Profile" (PDF). UNHCR. Archived from the original (PDF) on 27 October 2005. Retrieved 8 December 2015. This Helmand Province, Afghanistan location article is a stub. You can help Wikipedia by expanding it.